Today in Masonic History Johannes Brahms is born in 1833. Johannes Brahms was a German Composer. Brahms was born in Hamburg, Germany on May 7th, 1833. His father played several instruments and earned a meager living that way. When Brahms was young his father gave him his first music lesson. By the age of 7 Brahms was taking piano lessons. Since the family was living in poverty, Brahms had to contribute to the families finances. He would play in various dance halls. Anecdotal evidence has Brahms composing starting at the age of 11. Brahms was often not a fan of his own works and his works from the age of 11 were destroyed. The only reason it is known that the work existed was a fellow pupil of Brahms claimed to have seen it. Along with the piano, Brahms briefly studied the Cello. Brahms played several concerts in his teens around Hamburg, he did not become famous as a pianist until the age of 19 when he went on a tour. He would also conduct choirs and became a proficient choral and orchestra conductor. In 1853, Brahms had traveled to Hanover and then to Weimer where he met several other prominent composers of the time including Franz Liszt. On their first meeting, Liszt performed one of Brahms pieces. Brahms fell asleep during the performance, he would later state that he was sorry for that and that the travel had taken too much out of him. In Weimer, Brahms had met Joseph Joachim. Joachim gave him a letter of introduction to Robert Schumann. Brahms went to Düsseldorf and there was welcomed into the Schumann family. Brahms formed a close relationship with Schumann's wife Clara. There are indications that Brahms had strong feelings for Clara, and the two corresponded frequently. In fact all of the pieces that Brahms would write in the future would go through Clara's hands. When Schumann passed away in 1856, Brahms would distance himself form Clara physically, although they continued to correspond. In 1890, at the age of 57 and after composing many musical pieces, Brahms was resolved to stop composing. He was unable to abide by his own decision and would continue to compose until his passing. On April 3rd, 1897, Brahms passed away from a form of cancer (it is debated whether it was liver or pancreatic). Brahms is listed in many books and publications as a mason. Although Brahms did compose several pieces of masonic music, there is no evidence that he ever joined the fraternity. 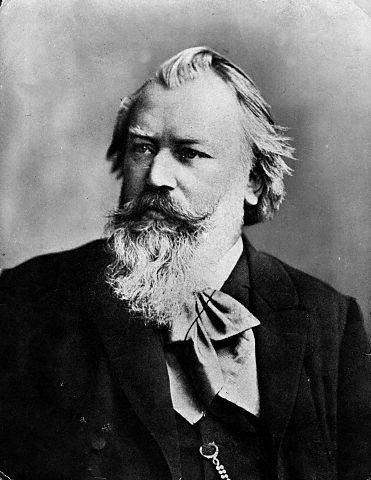 Brahms lived much of his life in Vienna and Freemasonry was illegal there during Brahms life. This information was obtained thanks to support from the German National Masonic Museum.